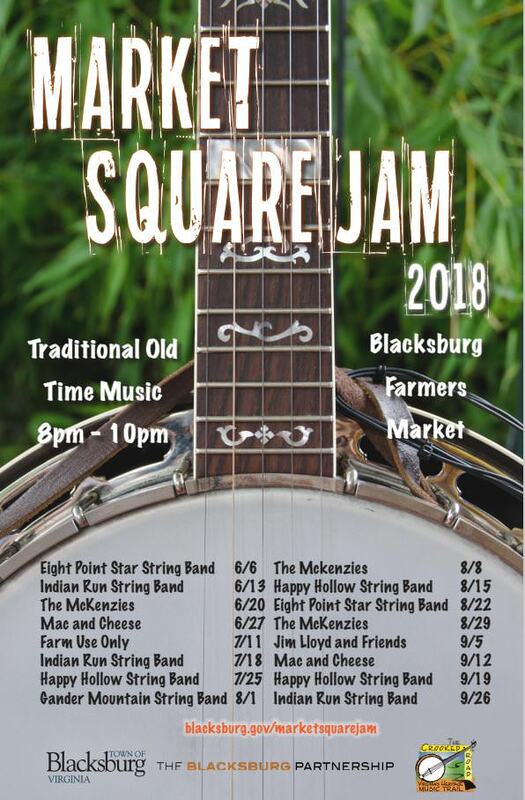 The Town of Blacksburg continues the 2018 Market Square Jam with host band Jim Lloyd and Friends on Wednesday, September 5, 2018 at Market Square Park in downtown Blacksburg, VA.
Raised in the coalfields of western Virginia, Jim Lloyd now makes his home in Rural Retreat, Va., where he operates Lloyd’s Barber Shop, a local gathering spot for collecting and trading tunes, stories, and songs. His musical roots extend back through at least four generations of fiddlers, guitar players, dancers, and singers from the mountains of Virginia and West Virginia. Jim is known especially for his skills on guitar and banjo. Jim was not only a consummate musician spreading old time music with his guitar, but also a radio DJ on WBRF radio at Galax and hosted a live band show called “Blue Ridge Backroads” for a year. He then moved to The William King Arts Center and hosted an NPR show “Living Traditions” for three years on 50 stations across the nation. It was through Jim’s show, “Living Traditions”, that he worked with Matthew Saunders and Polly King Ewell and became one of the first musicians to perform on the internet. Jim is an excellent instrumentalist whose work has been documented by the Smithsonian Institute as representative of Southwest Virginia mountain music and story-telling. While accomplished on many instruments, he is known especially for his skills on guitar (finger picking style) and banjo (claw hammer and two-finger styles). Jim shares his heritage not only by performing, but as a teacher to many local students ranging from ages 6 to 70 on basically anything with strings, particularly guitar, banjo, mandolin, and fiddle. Jim has performed at many regional shows as well as West Virginia’s Mountain Stage, Seedtime on the Cumberland (Appalshop), Birthplace of Country Music Alliance and the Minnesota Old-Time and Bluegrass Festival, just to name a few. Jim has two solo recording projects but can be found on numerous recordings by other fellow musicians. He currently is a member of the The Elkville String Band, but also plays regularly with Mountain Fling, which plays parlor music often associated with the Carter Family and other early mid-20th century artists. He regularly backs up his friend, Carl Johnson at the IBMA and other locations. He also performs solo and with makeup bands consisting of former students and friends. Whether he is solo or with a band, attending one of Jim’s performances is a real treat has he shares the music and stories that he has collected from life in the mountains. Jim has been nominated for a National Heritage Fellowship Award for his contributions to the preservation of the music and stories of Appalachia.